At this evenings meeting Alan Loweth spoke about the RSPB’s work developing Broadwater Warren, a reserve the group visited last year. Alan’s excellent talk gave an insight on the amount of work which went into creating heathland out of conifer plantations, bringing new species into the area, and the invaluable work volunteers have done there. On that note, the highlight of the evening, was Alan presenting Paul Yetman with a silver avocet pin badge to mark twenty-five years of volunteering for the RSPB. 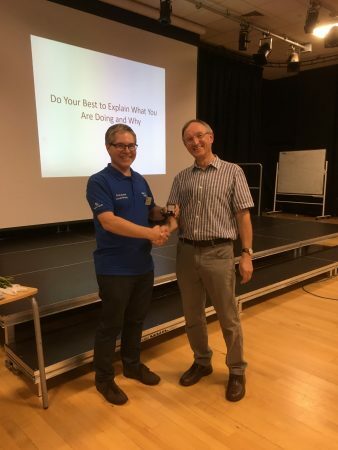 Paul has held various roles on the committee including field trip organiser, creating and managing the website (ably supported by Alan Else) and in 2014 became group leader. Paul also carries out swift surveys in Gravesend each year, and leads several outdoor meetings throughout the year. Congratulations Paul and thank you for your continued support for the RSPB and the group. A well earned award Paul, here’s to the next 25! Congratulations Paul and keep up the good work.